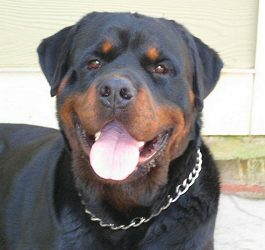 Characteristics: Massive size, heavy bone, intelligence, masculinity, and exemplary temperament are just a few of the things that come to mind regarding Raul’s defining characteristics. 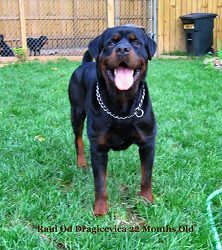 We are so thankful to Od Dragicevica for breeding this wonderful spokesman for the Rottweiler breed, and even more thankful to have him as part of our family here at Atlanta Haus Rottweilers! 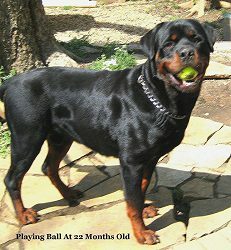 His intelligence, attitude, and sheer bold masculine beauty have us awestruck each and every day! 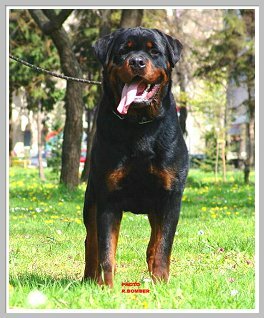 Our European import ROTTWEILER Raul Od Dragicevica has an incredibly massive headpiece with a ridiculous stop, thick tree trunk bone, perfectly sound temperament, and intelligence that makes training a joy. 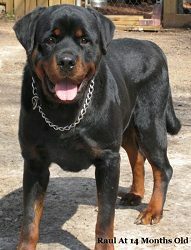 His drive and courage produce a demeanor that is rarely seen in Rottweilers here in the States. Finally, his movement is fluid and effortless, making all tasks asked of him seem simple. 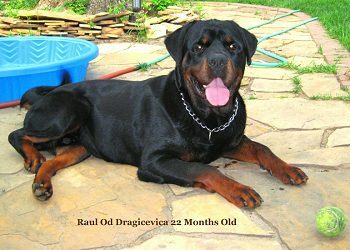 Pedigree Analysis: Raul has a world class pedigree with 12 out of 14 relatives on his three generation pedigree as INT, Dt. VDH, single, or multi country conformation champions. 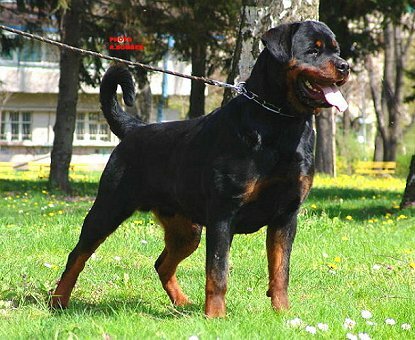 Combine that with the working accomplishments of these same dogs and you have a perfect combination of conformation and tremendous working ability. 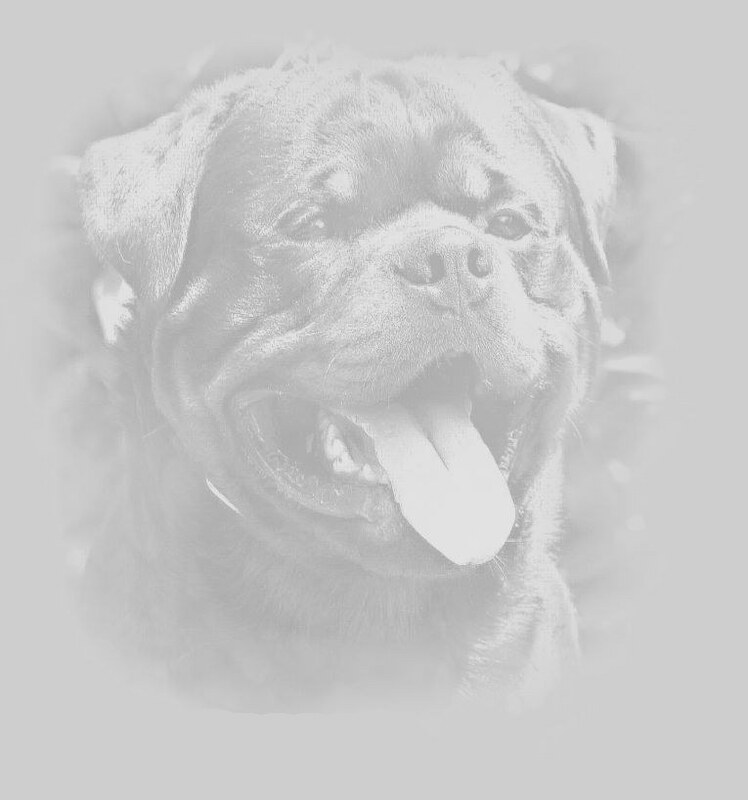 The males on his three generation pedigree are sire Dionys Od Dragicevica, grandsires Odo Od Dragicevica, and Chan Von Der Bleichstrasse, great grandsires Mambo Von Der Crossener Ranch, Beni, Rick Von Burgthann, and Matcho Von Burgthann. 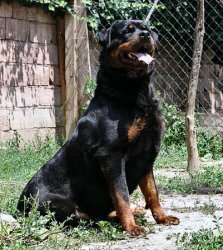 The Dams in his pedigree are equally impressive tracing all the way back to third generation heavy hitting producers like Hera Od Dragicevica, Bessy Vom Haus Kramer, Quenda Von Der Bleichstrasse, and Peggi Vom Calibra. 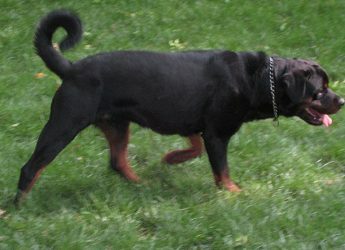 These dams combine for a line breeding on Raul’s top side pedigree of Chris vom Obergrombacher Schloss, combined with line breeding on his bottom side pedigree of Rick Von Burgthann back to Benno von der Schwarzen Heide. 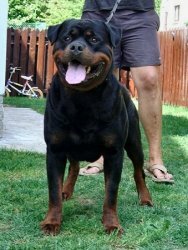 The line breeding of Rick Von Burgthann - Benno on his bottom side pedigree is then crossed with Rick Von Burgthann - Benno and a dose of Dingo V Schweiger Wappen via Mambo Von Der Crossener Ranch on his topside. Accomplishments: Raul is a multi youth winner in Europe, and we look forward to showing him in the Open Class USRC German style shows here in The States later on this year. We know who the competition is, and let’s just say that based on past results versus the competition overseas we are expecting Raul’s name to be well known by all in the very near future!